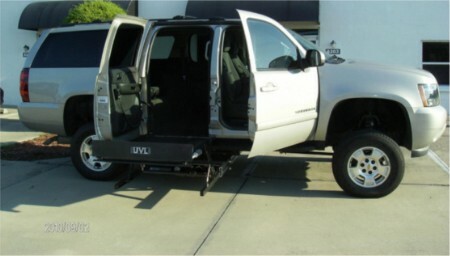 Research and info about the latest wheelchair accessible truck modifications. Yes, even a Suburban can be converted for wheelchair driving now! Ryno Mobility has announced they will be able to do a driver-side wheelchair accessible Suburban soon. There are already passenger conversions so that a wheelchair can fit in the Suburban via a lift. See the picture below for an example. What’s nice about the Suburban is that you still have a lot of extra seating available. In an accessible truck the seat directly behind the driver is usually not usable since the wheelchair takes up a lot of space. This entry was posted in Wheelchair Accessible Vehicles. Bookmark the permalink.